I picked this book up from the library in the hopes of getting some ideas for my scrapbook project over the next year. 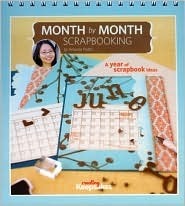 Since I'm hoping to sit down at the end of each month to scrapbook from that previous month, I hoped for a lot of great ideas. Unfortunately, it didn't give me the kind of ideas I was looking for. Rather than giving me layout ideas for different things that happen in specific months (particularly holidays), it was more how to use different kinds of layout pages in an abstract manner. It wasn't really BAD, because there were a lot of great ideas in there. But it wasn't what I was looking for when I picked it up.